A Wrinkle in Time (***1/2, 2018) with Storm Reid, Oprah Winfrey,Reese Witherspoon, Mindy Kaling, Deric McCabe, Levi, Miller, Gugu Mbatha-Raw, Michael Peña, Zach Galifianakis and Chris Pine. Screenplay by Jennifer Lee and Jeff Stockwell, Based on A Wrinkle in Time by Madeleine L’Engle, Directed by Ava DuVernay. When we first meet Meg Murray (Storm Reid), she is in terrible shape. He scientist father Alex Murray (Chris Pine) has been missing for four years. Although she has proven herself to be an excellent student on occasions, her grades are down, she is incessantly bullied by a clique of girls at her school, she a discipline problem for the principle (Alex Holland), she feels overshadowed by her genius little brother, Charles Wallace (Deric McCabe) and, as all fourteen year olds do sooner or later, has no confidence in herself. Then, one dark and stormy evening, the children and their bewildered mother Kate (Gugu Mbatha-Raw) meet Mrs. Whatsit (Reese Witherspoon) a free-spirited entity who seems to know Charles Wallace and is afflicted with a good case of Asperger’s syndrome. Soon afterwards, Charles Wallace introduces Meg and a school acquaintance, Calvin (Levi Miller) to the slightly narcoleptic Mrs. Who (Mindy Kaling), who dispenses her wisdom through quotes and song lyrics. The arrival of Mrs. Which (Oprah Winfrey), the third and seemingly most powerful alien shows up, she announces that the three have been chosen for an incredible quest: the rescue of Dr. Alex Murray from the furthest reaches of unknown space! When filmmakers dare to take on a nearly universally acclaimed piece of literature to adapt for a movie, they proceed at their own peril. For every Casablanca, The Third Man and The Godfather, there are dozens of others wrecked along the road to respectability (and profitability. Now in the docket is Madeline L’Engle’s A Wrinkle in Time, a young adult science fantasy novel which won the prestigious Newbery Award for children’s literature in 1962. It has been such a popular and beloved book that has NEVER been out of print. Taking on the challenge are director Ava DuVernay (Selma), director/screenwriter Jennifer Lee (Wreck-It Ralph, Frozen and Zootopia) and Jeff Stockwell with producer Catherine Hand and Jim Whittaker. It was mainly through the dogged persistence of Hand, who had produced a lightly received, 2003 ABC television movie version, that a big budget version was fully realized fourteen years later. And let me tell you, this version succeeds magnificently. I will tell you quite frankly that this film took my heart in its hands and ran with it when Meg, who was being bullied on the playground, lost her temper, took a basketball and beaned her queen bee neighbor square in the face. As someone who was bullied as a child, I felt immense satisfaction in seeing her do THAT! Of course, Meg was totally wrong in her actions, which also illustrates that a big part of her problem is her temper and acting impulsively. Cleverly, this of all plays into the narrative of the book AND the film, Meg trying her best to cope with, understand and control these feelings. And while the supporting cast is great, the whole enterprise firmly relies on the shoulders of Storm Reid, who gives a star-making performance. 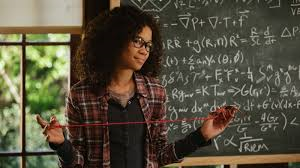 Over the past two days I re-read A Wrinkle in Time, have noted the changes that have been made and I think that this film is one of the best film adaptations I have had the privilege to see. Although it has been a nearly month since the opening of Disney’s other juggernaut, Black Panther, A Wrinkle in Time has performed slightly below its target of $35 million dollars in the opening weekend, I fully expect that in time, audiences, especially parents with kids over the age of eight or nine, will discover and LOVE this movie. Mark my words, despite the 42% Rotten Tomatoes score, a 52% on Metacritic and a just a “B” from CinemaScore, I fully believe that this film will not only succeed, but endure with children as time goes by. This entry was posted in Like Show Business and tagged Chris Barkley by Mike Glyer. Bookmark the permalink. I read the novel some moths ago, and made the mistake of reading all the other novels that follow. The first book is good, but the others have such a high level of Christian tomfoolery in them that they’re really unreadable. One has two teenagers sent back to biblical times by an errant computer, where they help Noah build the Ark. There are also fallen and not fallen angels, mastodons the size of small dogs, and lots of other biblical things. Stick with the first novel; don’t make the mistake of reading anything else in the series. I just hope they don’t try to film those sequels. I loved it. I missed a few things from the book, but that’s inevitable in film translations, and they were very internal things. I loved the incredible variety of faces in this movie, in the protagonist kids, the bullies, the Mrs, the grownups – so healing to see. The visuals were also spectacular. I had quite a bit of technical difficulty with the caption device, which failed to transmit more than 50% of the dialogue, but because I have read the book I think I understood most of it. Captiview or the theatres using it need to field test them better. This is the second time this has happened to me out of 3 times using one, in 3 widely divergent locations. ETA: oh, btw, it’s Murry, not Murray. 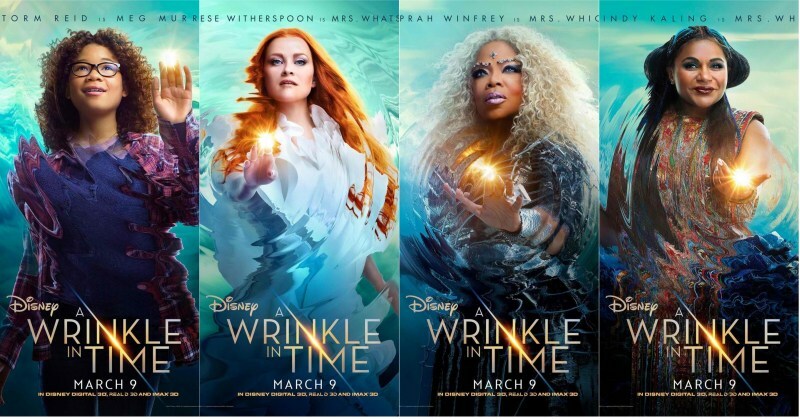 I have zero interest in this movie, but then I have no connection to A Wrinkle in Time. I have never read the book, since it wasn’t available in Germany when I was a kid. But that’s okay, because I am not the target audience for this film. The target audience are kids, their parents and people who loved the book as children and most of them seem to enjoy the film. A lot of film critics don’t much seem to care for it, but then they are probably no more the target audience than I am. One quibble: Casablanca as universally acclaimed piece of literature? It was an unproduced play.